In 2017, Nous was using a travel reconciliation process that was a productivity burden for its Accounts Payable staff. Nous has over 200 consultants with high volume requirements for domestic flights and accommodation, producing 4,000 invoices per annum. The time required to handle, analyse and reconcile this volume of paperwork had become a significant burden to the company. Efficiency and visibility issues with the travel reconciliation process. 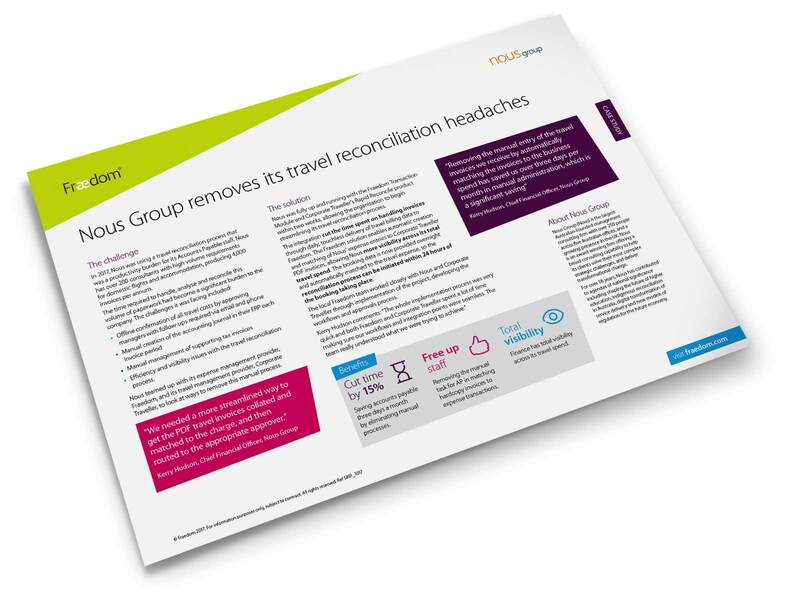 Nous teamed up with its expense management provider, Fraedom, and its travel management provider, Corporate Traveller, to look at ways to remove this manual process. View the full case study to learn how they are saving more than 3 days per month in manual processing by using Fraedom.